Civil society groups are local organisations including NGOs and co-operatives that have formed to improve the situation for their community. Some groups focus on human rights and help support people who have suffered abuse, others focus on practical solutions, for example by teaching women to sew. They have credibility with the authorities and a deep knowledge and understanding of the local situation. To be effective on the ground, especially with the community finance programs, we think it is much better to work in collaboration with a civil society group that can advise and help us implement the offer of loans for groups of people who wish to set up businesses. At the moment we are working with three civil society groups – ABFEK in Mumosho, UFIN on the island of Idjwi, and CPVD in Sake, Bweremana and Minova. ABFEK was started several years ago by Amani Matabaro to provide accommodation and support for women who suffered during the war. He built them a house in Mumosho, 25 kilometres south of Bukavu, provided for their children and set up schemes to help them earn money. He also collaborated with Falling Whistles and the Rotary to build the covered Peace Market in Mumosho and is now leading Ensemble Pour la Difference, the incubator we have set up in Bukavu. Amani knows the people in the Mumosho area and they very much respect him and look to him for advice. With Amani’s help we have set up several businesses in the Mumosho area including a brick factory and cantine. The main women’s group in North Idjwi is called UFIN and is led by Madame Esperance, the wife of the Mwami who is the king of the northern half of the island. UFIN has nearly 500 members and has built a compound where women can meet, cook, garden and learn to sew. The organisation is deeply integrated into daily life and a registered civil society group, both of which are reasons for Luminosity to provide support through UFIN rather than trying to do things ourselves. The authority and leadership provided by Madame Esperance is also a major factor and we now have four projects underway. 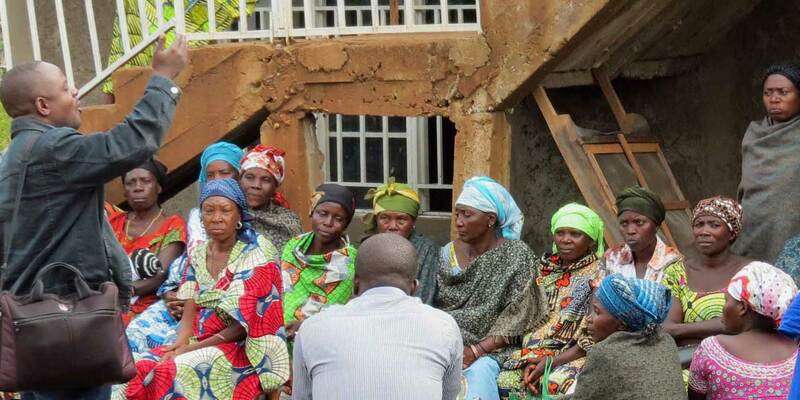 The Coalition des Volontaires pour la Paix et le Developpement (CVPD) is a Congolese NGO who work closely with women’s groups in several towns in North Kivu, including Sake, Bweremana and Masisi. CVPD is led by Arnold Djuma, who has worked for many years as a brave advocate for the rights of women and children who have suffered from violence and slavery. Their work helps people to stabilise, re-integrate and move forward, and Luminosity provides the loans and practical advice to convert new hope into a business that gives people the means to continue. It takes a few months after liberation for a community to feel ready to start working in this way, but once they are stable – as we have seen in Bweremana and Minova - people will collaborate to build a better future. We have five active projects with CVPD and are now looking at supporting further projects in the Masisi area of North Kivu.